As regards an actual CD of Odditties I confess that I’m not set-up to make one and don’t have plans to press any at the moment. I will however contact distributors that Kate and I have worked with in the past and see if they are interested in pressing and selling them and will update the site when there’s some news. ODDiTTiES ☆ Kate & Anna McGarrigle ☆ with additional notes about the songs. Go to Outside Music’s page and type in Odditties in the search box on upper left. Thanks. The cd will soon be available, April 2011, in the UK and Europe. Watch for news of it. I’m cutting and pasting from the last blog yet my fingers are not sticky. 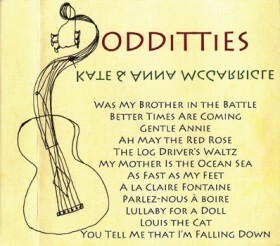 Odditties is: a few Stephen Foster songs, but not the versions that are already out on cd, a couple of Wade Hemsworth tunes including Log Driver’s Waltz but different from the animated film by JF Weldon, some vintage Kate and Anna, a lullaby for a doll, a studio version of a Cajun tune we used to do live, a very old live version of A La Claire Fontaine from 1976 and lastly an early 70s living-room demo about a lost cat called Louis. The music goes on. Said the Gramophone Sean Michaels’s music blog about Louis the Cat. And this NY Times article mentioning the Log Driver’s Waltz. Kate and I were famous for not touring. Our foray into the music business coincided with the births of our children so we kept long distance travel to a minimum though we did make it to Hong Kong and Australia in the mid-80s. To satisfy the creative urge we’d spend lots of time and money recording demos for projects, some unrealized. One of these was the great Stephen Foster biopic idea that Kate, Dane, Janie and I pitched to PBS back in 1987. We wanted to cast Jeremy Irons as the dissolute composer. We knew some Foster songs from our youth, Gentle Annie and Ah! May the Red Rose, but we needed to beef up the repertoire. Bob Borgen, who works for the L.A. Kings Hockey franchise, and his wife Minako have been great supporters of ours and they found us the Foster Civil War songs, Was my Brother in the Battle? and Better Times Are Coming. These 4 songs are all demos that were never released and in some cases are sweeter than the ones that did make it out there. Rufus is playing tambourine and singing on Better Times. In about 1978, our friend John Weldon, an animator with the NFB, asked us to record Wade’s Hemsworth’s Log Driver’s Waltz which he was about to animate for the NFB Vignette Series that ran on CBC/Radio-Canada through the 80s. Most Canadians know us because of John’s really funny film. The version of Log Driver on Odditties was recorded a couple of years later when we were doing music for a documentary. Kate sings the melody on the verses which is the way we used to do it and I pick it up on the choruses. Gilles Losier’s fiddle puts it in the dancehall. Wade H. was a friend of Peter Weldon’s and Jack Nissenson’s with whom we sang as the Mountain City Four. He was the first songwriter we’d ever met and most famous for the Black Fly Song. Hard to believe he also wrote My Mother is the Ocean Sea, it’s so different, and must be his most beautiful composition. It’s in 5/4 time. Wade claimed this was the rhythm of the rolling ocean. To make it simpler for us to understand, he said count 1-2-3-1-2. We eventually caught on. Joel Zifkin’s violin and Danny Greenspoon’s guitar rock us gently on the waves while Jody Golick’s sax warns us about icebergs. Kate’s vocal is particularly beautiful and we all sound like sailors on the big chorus. Kate wrote Lullaby for a Doll about little Martha, herself a doll, but a little doll that wouldn’t go to sleep like the other dolls. I remember Kate saying that when Martha was born, Martha’s whole life flashed in front of her. The image of a small child, herself with children and having a dentist, a doctor, to monitor each call, seems unsettling. A baby girl is born with all the eggs she’s ever going to have (in one basket), like the egg-chain in a chicken. Ah! the inevitability of it all. Joel and Kate produced this track. The late Scot Lang is on guitar and bass. A la claire fontaine, Pollack Hall-McGill U.1976, with Chaim Tannenbaum on harmonica, was always our last encore. Often friends and family, my husband Dane Lanken, Peter Weldon, sistra Jane, later all the kids, would join us onstage for this old French folksong made famous by Madame Emma Albani, an internationally known star of the Opera, who was from Québec. Our mother Gaby told us that her father’s cousin Camillien Houde, Montreal’s most famous mayor aka Monsieur Montréal, also used to sing it to Gaby’s piano accompaniment. She said Houde had a lovely voice. One more thing about our mother Gaby. She played the violin in the Bell Telephone Orchestra. Things were different back in the 30s. I wonder if there’s a recording of this outfit. In the late 60s Kate decided to take up the violin and she glued the bridge on Gaby’s violin with crazy glue. It was crooked and had to be sawed off. The violin was lost along the way. As Fast as my Feet Can Carry Me, from 1990 with Kate playing amazing piano and Pat Donaldson picking the bass like an automaton, a real power-couple, and You Tell me That I’m Falling Down were mainstays of our live shows when we had a drummer. Gordon Adamson is pounding them on As Fast and Gerry Conway is on You Tell Me That.. The band members could let loose on these two numbers and the songs were often set closers. The first of these I co-wrote with Chaim Tannenbaum, the other with Caroline Holland. You Tell Me That I’m F D was covered by Linda Ronstadt in 1975. Our version is from 1979. Andrew Cowan plays the guitars on both these and Chaim leans in with his mandolin for You Tell Me…Andrew described his guitar on As Fast as My Feet as sounding like a ski organ, whatever that is. We learned Parlez-nous à boire from Louisiana’s Balfa Frères and worked it up for the stage. This studio version is from the early 80s with Kate on banjo, Gilles Losier on fiddle and feet and Andrew C. on guitar, Pat on bass and me on piano and accordion. Janie might also be singing on the chorus. In 1973, I was working for a store-front lawyer on Wellington and Charron in Pointe St Charles, a working-class area in downtown Montreal, made famous by David Fennario in Balconville. I was leaving the store one night when this skinny little girl came up to me and offered me a kitten. I’m seriously allergic to cats but I couldn’t refuse. I’m sure the family didn’t have enough to eat themselves. The diet down there was baloney and beer from the convenience store. There were no supermarkets. I took the cat home and Dane and I named him Louis and doted on him as if he were a child. He was quite stupid but very charming. When he disappeared 9 months later we were inconsolable. We cried for 3 weeks. My friend Audrey Bean helped me write and sing Louis the Cat. We recorded it in my living-room on on old Sony 2 tr. The following year Audrey and I wrote Cool River which was recorded by Maria Muldaur in 1974. Some of Kate’s and my happiest times were spent in her living-room singing and playing with our wonderful musician friends. It had become quite a spiritual pastime, especially in the last ten years, like praying without asking for anything. With eyes closed we’d listen carefully for what the others were doing. Kate would set a frailing groove on her banjo, I would find a drone part on the guitar, Joel would do a double-stop thing on his fiddle with a delay effect, Michel Pepin would rock the cradle in the bass end. Then we’d add the voices. Martha and Lily were there and sometimes Chaim was too, on harmonica and mandolin. Once Kate invited a percussionist called Ganesh to sit it. I’m pretty sure we reached Nirvana. The Celebration of Kate McGarrigle at London’s Southbank in June was a smash hit. We saw ✰s. 5 ✰ reviews. The musical guests were all extraordinary and with Kate’s wonderful songs how could it miss. Richard Thompson proposed the evening in his capacity as curator of this past Summer’s Meltdown Festival and Joe Boyd put the talent together. A wonderful team. There’s talk of another Kate tribute in NYC in the Spring of 2011. That night, Martha sang ‘I Am a Diamond’, a song that Kate, Jane and I wrote for a musical that never did get produced, and which Kate often did in concert. Martha’s touching performance rekindled interest in this project which is very exciting. Then it was the opening of Rufus’s very first opera, Prima Donna, at Toronto’s Luminato Festival. The venue was the beautifully restored Elgin Theatre. I hadn’t seen PD before though I’d heard it as it was being composed over the last couple of years. Prima Donna blew me away. It’s a new traditional opera and it’s very very good. I was in tears at the end. Then, Rufus followed this up with his very dramatic solo performance of the songs from All Days are Nights with stark visuals of his heavily-kohled eye (a little more than the Taliban usually apply), opening and closing, opening and closing. A little while later Martha blew (blowy blog) through town with the Piaf show, Sans fusils, ni souliers, à Paris, her great little combo of Brad, Thomas and Doug augmented by strings, horns and a large choir. The showstopper that evening was a lightly rehearsed version of Les trois cloches that la Môme and les Compagnons de la chanson made famous in the 50s. We still have the old Piaf 78 rpm of it at Gardencourt, badly cracked from years of love and abuse. Martha did her last Piaf show at the Outremont in Montreal last night. We were all able to walk to the gig. Kate always did want to own a theatre. The Mittenstrings: Lily, Sylvan and Kathleen W. did a very nice opener (and play again tomorrow night at the Yellow Door 9/11.) Martha was in top form throughout the Piaf plus we got to hear a couple of her new songs, one which dazed old Naan called 4 Black Sheep in the Night, about driving to a gig in blinding snow (a few years back) They were on their way to the Black Sheep Inn in Wakefield Qc, an old logging town on the dark Gatineau River. This reminds me that Kate brought home 2 freshly shorn sheepkins from West Yorkshire last year. She had gone to the debut of Prima Donna at the Manchester Opera Festival. I ♡ ewe. Two weeks ago, Rufus invited Janie, Lily and me to join him for The Last Song of Summer, his annual fundraiser for Robert Wilson’s Watermill Foundation in the Hamptons, now in its 3rd year. Kate was his inspiration for this event and she made it to the first 2. Janie accompanied Rufus on Over the Rainbow and we all sang back-up for Rufus and his special guests, Kylie Minogue and Krystle Warren. I wondered if the fact that both their names started with a K affected his choice. It was a lot of fun to sing on Kylie’s dance hits and Rufus sounded amazing in his high register on these songs. He’s got to make a dance recording. And write another opera. Last year, Kate and I started to assemble some of our unreleased songs (versions in our possession that had not been available commercially) into various compilations. The first of these ‘Odditties’ has now been uploaded to itunes (on the querbeservice etiquette) through the miracle of Tunecore, the indie label’s friend. It should be ‘live’ within the next couple of days. It was in late 2008 that Kate started the querbeservice label, a play on words using her street name Querbes, (s is silent) in lieu of curb, an expression that used to denote fastfood served to your car but now has a more sexual connotation and in this case it’s music served up in your car or wherever you want it. Bon appétit. Odditties is: a few Stephen Foster songs (but not the versions that are already out on cd), a couple of Wade Hemsworth tunes including Log Driver’s Waltz (different from the animated film), some vintage Kate and Anna, a lullaby for a doll, a studio version of a Cajun tune we used to do live, a very old live version of A La Claire Fontaine from 1976, plus an early 70s living-room demo about a lost cat. The music goes on.